Hostels have long been the accommodation of choice for 20-something travelers on a budget, thanks to their rock-bottom rates. For a mere fraction of the cost of a traditional hotel room, you can spend a few days in some of the world’s best cities without blowing your life savings. In recent years, hostels have become an attractive option for all travelers, not just poor college students, thanks in some part to their affordability. Families, senior citizens and couples have started staying in hostels when traveling — and it’s not just because of the cost. In fact, it’s the other benefits to staying in a hostel that are attracting guests. Hostels, for the most part, are no longer “no-frills” accommodations in which you’re forced to sleep on a bunk bed in a room with several strangers. Many hostels have upped their games in recent years, sometimes offering amenities on par with hotels, including private rooms. And there are other perks as well. Not convinced? Check out these five following reasons that you should consider a hostel for your next European adventure. Note: You can book through HostelBookers through the link below. This won’t cost you any extra but we do receive a very small commission when you book a hostel with our link. Thanks and we appreciate your support! When you want to be in the heart of the action in any city, you’re probably going to pay for that privilege. Hotel rooms in the most desirable locations, near popular attractions, lively nightlife and the best shopping and restaurants often go for a premium. But hostels are usually located in the same neighborhoods as those big hotels, offering you easy access to what you want to do and see. Explore the hostel options in your destination city to see what’s available — you may be surprised to find you can get an affordable place to sleep right in the thick of things. For example, when you look for Dublin hostels on Venere, you can sort the results according to neighborhood – and score a great spot in Temple Bar or City Centre. Okay, so you probably won’t find a world-class spa or a five-star restaurant in a hostel. But in many locations, you’ll find unexpected amenities, including swimming pools, workout facilities, even bowling alleys and movie theaters. At the minimum, you can usually expect to find Wi-Fi and a communal kitchen, where you can whip up simple meals and save money on dining out. For some people, the presence of other travelers is a drawback to staying in a hostel. However, your fellow vagabonds are one of a hostel’s best features. Unlike in a traditional hotel, where all of the guests keep to themselves, at a hostel, you can spend time meeting and chatting with other people from around the world — people who may be great resources on the things you need to do and see in the city, exploring partners or even lifelong friends. If you’re friendly, outgoing and talk with your fellow hostellers, you may find that the restaurant where you were planning a romantic dinner closed six months ago or that there’s an exhibit by your favorite artist at a local gallery. Hostels want to attract travelers; to do so, many are increasing the number of “extras” they offer. Some hostels are organizing tours or other activities for guests, including game nights, cocktail parties or scavenger hunts. Not only are these activities a great way to get to know people and see the city, they also save money — even if the hostel charges a fee for a special tour or activity, it’s generally lower than an excursion with a tour company. You can usually pick up discounted admissions to local attractions from hostels as well. You’re traveling because you want to see the world and experience new places, right? So why stay in a generic hotel identical to the hotel next to the airport in your hometown? 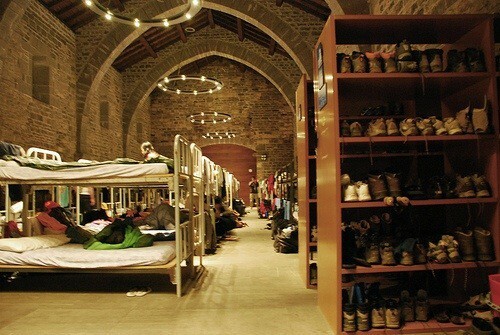 Many European hostels are housed in converted buildings with rich histories — you may find yourself sleeping in a former church or castle, or even in a something a little more unusual, like a cave or tree house. And since most hostel employees are locals who are eager to share their homeland with visitors, they can give you the scoop on the area and life in the city, giving you a unique perspective you won’t find elsewhere. Of course, the economic aspects of staying in a hostel are a major draw, but before you dismiss such accommodations as being “just for kids,” check out some of the other benefits. You may discover that hosteling is right for you after all.